Locally owned and operated since 1948. 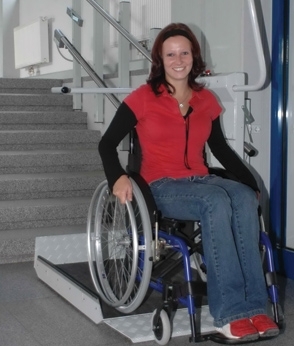 Wheelchair stairlifts provide wheelchair access up and down straight stairs using a rail system. When it is not being used, however, the lift compactly folds up. 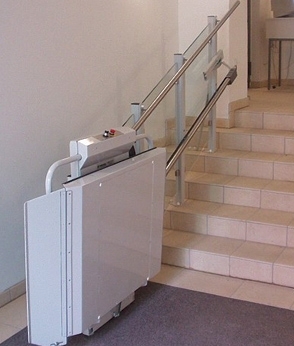 Kohll’s offers the Delta inclined platform lift made by Savaria. This one of the most popular choices, simply because we believe it is the best wheelchair stairlift available today. Power is not an issue with battery charging stations located at both the top AND bottom of the rail system. Why use a battery? Simple. If your power goes out in your home or business then this wheelchair stairlift will still be ready to go. We offer many stair sizes as well. Affordable alternative to an elevator or vertical lift: Provides access without significant renovations. Space-saving design: Sleekly finished traveling rails and foldaway design. Machine roomless: The drive system is housed with the lift, so no additional machine room is needed. 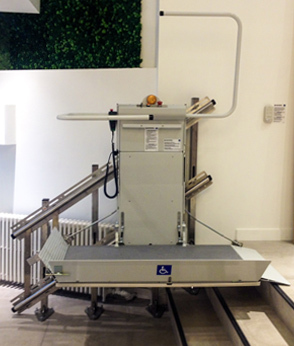 Battery powered/Charging stations: Battery ensures the lift operates through a power failure. Charging stations at the top and bottom ensure the lift is always ready to go. Other standard features: Constant pressure buttons to move the lift up and down, motor housed on board the lift, modular rail system, manual folding platform, pendant control, keyed call stations, keyed operation. 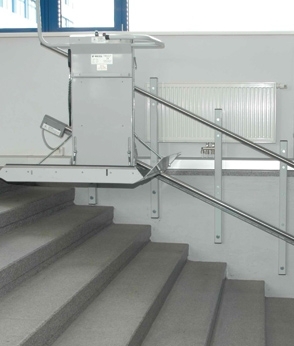 ADA-compliant platform: Optional ADA-compliant platform, ideal for public accessibility requirements. Safety features: Obstruction sensor system on the platform, non-skid platform with side safety flaps, overspeed governor, manual lowering device, keyed access for call stations and emergency stop button. Other Options: Motorized folding/unfolding of platform and safety arms, fold-down seat with 330 lb (150 kg) capacity, pedestrian warning light and movement alarm, and stainless steel rail (required for outdoor applications). Commercial Package: Includes power folding arms and platform, additional battery pack, audio visual alert, folding seat, ADA-compliant platform. * For outdoor applications, consult your local Savaria dealer as not all climates may be suitable for outdoor installations. ** Note that the speed may vary depending on the angle of the stairs. Kohll's has been serving patients in Omaha, Lincoln and western Iowa since 1948. We provide high-quality service to better your health. © Kohlls Rx - All rights reserved.